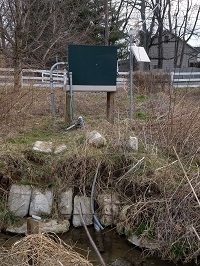 LOCATION.--Lat 39`59'29.56", long 76`15'39.35", Lancaster County, Hydrologic Unit 02050306. PERIOD OF RECORD.--October 2008 to October 2017 (discontinued). GAGE.--Water-stage recorder, crest-stage gage, and water-quality recorder with electronic data logger. Elevation of gage is 325 ft above North American Vertical Datum of 1988, from Lidar. COOPERATION.--Station established and maintained by the U.S. Geological Survey. Funding for the operation of this station is provided by the Pennsylvania Department of Environmental Protection.